"God makes all things grow and change. Just like the polliwog, you will get bigger and grow stronger. One day you may even be as tall as your Daddy or Mommy. Every day you are learning new things. God has wonderful plans for you as you grow up." The second page of the spread offers a fully illustrated scene depicting the animal in focus, with a few random facts about the frog. Lastly, it includes a scripture verse for memorization. In the case of the lesson on frogs, the youngster is encouraged to memorize Luke 2:52 which says, "So Jesus grew both in height and in wisdom, and He was loved by God and by all who knew Him." Ants = Small people can do big things too. Additionally - ants are hard workers. Geckos = When we are hurt or frightened, we can run to God for help. Sea Otters = Little children are active and we need to rest and take care of the bodies God gave us. Dolphins = We have been given friends that we need to learn how to respect and treat well. Cuckoo Bird = We need to learn to share and be kind to one another. Bears = Learning about God and the world around us helps us to grow as people. Bats = We need to have sensitive ears that learn to hear what God might be saying to us. Wildcats = We need to control our anger. Gorillas = Families love and protect one another. Owls = We do not need to be scared, but need to put our trust in God. Rattlesnakes = God warns us to avoid dangerous things. The Oxpecker and the rhino = We need friends. Aardvarks = We have special gifts and abilities. Spiders = Lies are like webs; we need to learn to tell the truth. Porcupines = Be kind one to another. Monkeys = Practice makes perfect and we need patience while we practice doing new things! As you can see, there is plenty to learn from and grow with. I also like this book because it is easy to add additional materials to the devotional. You can stick with the basic one page lesson (which reads more like a story, than a "lesson") or you can tack on additional verses, videos or books about the specific animal that you are focused on. I believe the title of the book gives a very accurate time estimation if you want a quick and short lesson to read through in the morning as everyone is eating breakfast or perhaps following dinner. I think the information provided makes this book most suitable for ages 3-6, although it likely appeals to children on the fringes of that age range as well. I've let Bookworm1 poke around the book a bit and he has enjoyed the artwork by Amy Wummer. The back of the book describes the illustrations as being whimsical and I suppose they are that, but Bookworm1 is happiest when a picture is accurate and these drawings are detailed enough to satisfy. I have not let Bookworm1 see the page spread about the whales, because I'm afraid that when he discovers it, that will be the only page he wants to read. Personally, we're of the opinion that the entire book is worth some attention, although there's certainly nothing wrong with learning to sing praises to God all day long. Heh. 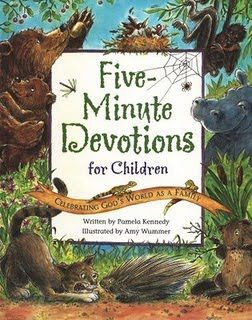 We are positively delighted and excited by Five Minute Devotions for Children and therefore I am even more excited that Ideals Books has offered an extra copy of this book to one of you! Would you like to win? Simply leave a comment below. This contest will be open through Thursday, February 18th and is open to U.S. Residents only. I really think that this is a magnificent resource and so I offer my heartfelt thanks to Ideals Books for providing it for parents to use. If this one sounds good to you, you might be interested to know about My Big Book of 5-minute Devotions which includes 40 short stories. We'll definitely be looking into that one for ourselves after we're done with this one! This sounds like a delightful book! Put me down for an entry! :) How fun! Lovely!! I would love this as another resource to talk about God! I'll throw my name in for this one as well. It looks wonderful! Looks like a great devotional that my boys would love! Thank you for the chance to win! Thank you so much for your blog! I just love reading your book reviews and comments. These would be perfect for our preschoolers!! Please enter me. This looks like a very nice book. Thanks for the chance to win it. My son and his wife and new baby, only baby, go to church every Sunday. Also, strive to put Christianity to work in their daily lives. I would love to win this book for my grandbaby girl. This book looks awesome . . . I love the combination of the devotions with animals. If the inside of the book is anything like the cover - then it looks fantastic! This looks just lovely!! Thanks for the chance! Sounds like a great book! My daughter would definitely love to use a book like this with my little granddaughters! Please do not enter me. I already own this book and had to comment with an agreement to your aboslute like for this book. It really is a good devotional to do with the kids. We enjoy it greatly. This sounds perfect for my little girl! Yes, I'd love this! I think that Kyle would love the science/God focus. I would love to read this with my 2 daughters. Thanks for the chance to win! This sounds like it would be wonderful to do with my kids! Thanks for the opportunity to win! I would love to give this to my niece. Thank you for the chance! Please enter me. Sounds like a great book for kids!